In a moment which so urgently demands that we step forward to alleviate the suffering of the world, where do we take refuge? Where do we find the ground from which to act justly and with compassion in difficult moments? 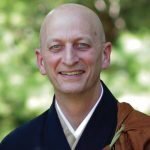 Shugen Roshi invites the sangha to present their understanding.